Argggh me hearties! I'm Pegleg Matey. I sail the seas of Scrub-a-Dub Island, always in search of fun & treasure. I love to play tricks on my other Matey friends. My favourite animal is my shipmate - Shivers the parrot. He is a bit clumsy & is always squawking & flapping his wings trying to beat me to the treasure. Kind to sensitive skin. 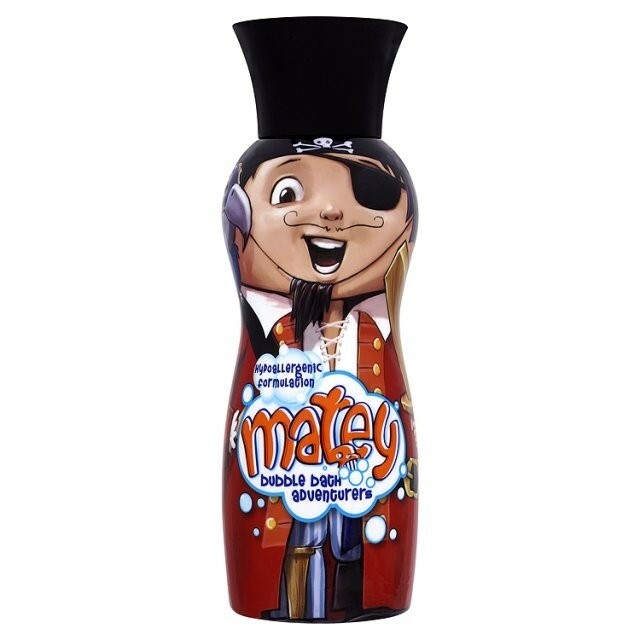 Matey is mild & gentle with a hypoallergenic and skin-pH neutral formulation. Aqua, Sodium Laureth Sulfate, Cocamidopropyl Betaine, Sodium Chloride, Parfum, Sodium Lactate, Lactic Acid, Trisodium Ethylenediamine Disuccinate, Sodium Benzoate, CI 47005, CI 61570. An absolute favourite in our family. The packaging is classic and fun. A bottle that doubles up as a toy after the product has run out!! What more could you ask for. It is perfect for the kids as it is hypo allergenic. It produces millions of bath time bubbles and is excellent value for money!!! A timeless, classic bubble bath!! My youngest loves this Matey, he went through a pirate phase and everything had to be pirate. We came across this bottle when shopping and we had to buy , just incase he ran out of the first lot. Easy to use, great scent and leaves a nice bath full of yummy bubbles!